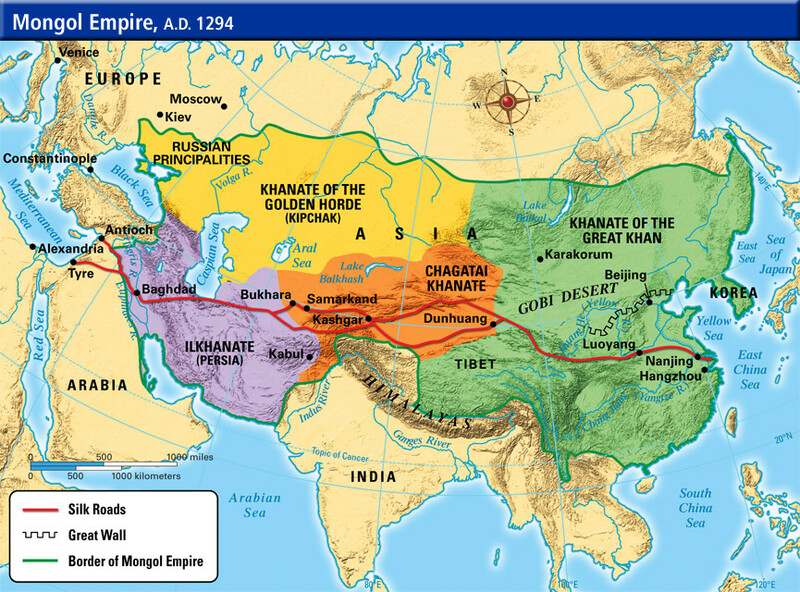 What prevented the Mongolian Empire from expanding into Europe? The Mongolian Empire reached quite a vast extent according to the map below and leaders such as Genghis Khan seemed to defeat all their enemies consistently. Yet, the empire never extended into Europe, or even the Baltic states. What prevented them from invading and succeeding like the Huns did, for example? 1) The death of Ögedei Khan forced the hordes rampaging through Europe under Subutai to break off and return for the Kuraltai to choose a successor. Interrupting their hard-earned momentum, and giving the Europeans time to regroup, recover, reflect and prepare, was the deciding factor - also, Talabuga was not the general Subutai was. 2) Hungary is the end of the great Eurasian steppe - the "sea of grass" - that sustained Mongolian logistical supremacy. They were successful in the short term in pursuing conquests beyond this area - usually due to Chinese and Islamic engineering, the co-option of which was a significant factor in their success - but the setbacks they did encounter occurred away from the steppe, where reinforcements by the tens of thousands could be summoned in devastatingly short order. The Viet and Champa in their thick jungle, the Majapitt and their thalassocracy, the Mamluks in the desert hills - all of them counted geography as major allies. So it was with the Europeans who were even a little successful against the Mongols. 3) Some of the Europeans adapted faster than others against their Mongolian opponents. The Georgians almost beat them, the Croatians and then the Serbians did beat them (tho not decisively, and Serbia did acknowledge suzerainty of the Mongols to stop them from coming back) - Bela IV of Hungary, and his grandson, Ladislaus IV, took what worked, and built a successful strategy to repel the Golden Horde when they returned. Innumerable stone castles in very defensible locations, well stocked and garrisoned with trained and equipped forces, capable of supporting each other. A scorched-earth strategy, denying the invading armies of provender and supply. Harrying tactics borrowed from the Cumans, steppe horse-archers similar to the Mongols that Ladislaus IV had defeated prior to the Golden Horde's arrival. The Mongols could loot at will, but were constantly under attack. The Hungarians refused to give them a decisive battle, until the invaders were weakened and depleted and in conditions favorable to the defenders, who were wise to Mongolian battle tactics thanks to the influence of the Cumans. And what could be more European than the Fabian strategy? A very important reason was the death of Genghis Khan, the "maximum leader" in 1227. This caused his Empire to be divided into four "Khanates" (see bottom of link), Russia (yellow), the Middle East (purple), Central Asia (red), and China-Mongolia (green) in the map above. The Death of Ogedei Khan in December of 1241 is the most attributed reason for the discontinuation of the invasion of Europe. Batu, son of Jochi, son of Genghis was the supreme commander over the European assault and a potential candidate for the successor of Ogedei. He knew he was less favorable and probably never going to be great khan so he wanted to continue but most of his generals withdrew due to their obligation to attend the Kurultai. A thing to possibly consider is maybe Tsubodei received information from his covert agents and/or reconnaissance scouts that further invasion into Germany or Italy would cause most of the remaining European nations to form coalitions and crusades against them. The Lithuanians prevented the spread of the Golden Horde (and Islam) throughout Europe, they liberated Ukraine (Kiev) at the Battle of Blue Waters (1362) which accelerated the decline of the Western sphere of influence of the Mongol Empire. They were never able to regain the region after that point. 1) distance - the mongols could only have projected a relatively small amount of power into Europe, yes they could send a horde of mongols, but their allies marching from china is another matter, and their commitments to their heartlands would restrict the amount of power they could project. 2) logistics the mongol hordes required a lot of grass, sustained campaigns were difficult. expansion into western Europe would have all sorts of problems. 3) societal structure, the mongols simply did not have any effective way to command and control a vast empire, any projection would just be an adventurer without real support. returning because a leader dies shows the lack of a real structure for ruling large empires. without the well defined an organised structure the mongol empire ws splitting apart before it was finished being created. 4) the mongols are not quite the invincible force they are often made out, the key factors in the mongol conquest of china was china was divided and the existence of local allies willingly to work with the mongols. conquered china with the help of the mongols themselves. 5) feudal structure of Europe made it pretty resistant to conquest. empires are easy chop of the head and the rest is long used to subservience, with the feudal structure each little lord was independent not used to obeying their own kings and long used to rebellion. Well firstly, the Mongol empire was spread out across a massive landscape, but they held it down nonetheless. That takes high military might and a sheer grip of terror on the peoples of the land to hold that huge amount of conquered land in those rough days. That wouldn't matter had the Khan of Khans been running a campaign against Europe though. Make no mistake, the Mongols conquered the landscape size that they did due to their cunning as much as their brutality. We might be living in a VERY different world if Obedai Khan hadn't died and forced the Kurultai to choose a new successor. Subutai had been starting the very beginning of their campaign in Europe and had already trounced Russia and slaughtered their forces, brave though they fought to nearly the last man. One piece of conjecture is that "Germans" invaded from Europe to the East joining up with the Mongolian Horde in the total annihilation of Baghdad. There is apparently much written in Islamic History about an "overland attack from the West" in conjunction with the Armies from the East as the reason for Baghdad's extermination. My understanding is that Polish Armies did engage the Mongols "for the defense of Europe" but were annihilated as well. As far as settlements go though the Golden Horde went no further than Crimea where they built a massive fortification to prevent any invaders from striking from the West. Those fortifications and the slave trade that was common in Crimea lasted for Centuries thereafter. Not the answer you're looking for? Browse other questions tagged military mongol-empire invasion or ask your own question. What were the advantages and disadvantages of Mongolian cavalry (compared to European cavalry)? Why were the Mongolian armies able to to use greater percentages of archers than (Medieval) Europeans? Was there any empire that was destroyed while still expanding? Is there any evidence the Mongols expanded into northeast Asia? Why did the Mongols outlaw intermarriage between the Mongols and the Chinese and forbid the Chinese from learning the Mongolian language? Why were fragments of the Mongol empire named after colors?